This is a ask blog I run where Dash has anime inspired fights with other characters. If you or anypony you know has first hand knowledge of the events that transpired last month in relation to the Vinmart establishment and the theft and vandilization of the Moon, please contact the Royal Equestrian Military representative, Spitfire, currently staying at the Ponyville Inn as soon as possible. If you have not already presented what you know to the local authorities, your information could be valuable to an ongoing inquest into the innocence or guilt of those accused of perpetrating the event! Don't stay silent! Any and all contributions, concerns or testimony must be presented before Sunday, September 2nd at 12 AM! Anything presented after that cannot and will not be verified! Location is in the Everfree Forest. West of the Library you will find a trail leading into the woods. Follow the trail until you come to a large hollowed-out oak. Look for the balloons to know you're there. Everything must go! No reasonable offer will be refused. Hi there Every art pony! I'm been a long time artist and just a few years ago i've started posting online. My mane experiance lies in traditional pencil sketch cartooning and photography. Currently I've been moving into digital art turf and anime style. I'm pretty knowledgeable about art so feel free to ask me for advice and my fair evalutions critiques. I make no claim to being an art professional and I work low budget and self taught. My art consist of nerdy concepts and random ideas.I do it manely to stay sane and for fun. School Is Soon In Session! 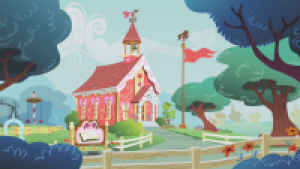 After a well-earned summer vacation, the Ponyville Schoolhouse will soon be filled with (Hopefully!) eager-to-learn foals once again! School shall begin on Monday, the 20th! Cheerilee and the fellow teachers are looking forward to meeting their new students! Our very own Terraria server is up! Go here for more information! Which pony country has the best name spinoff? An unfolded note tacked on the notice board By the Town Hall. Pinned up next to it is a rather pretty orange and pink fresh flower lei. As many have noticed, posters have been placed around town announcing the dates of the InterCity Gymnastics Competition coming up! "The bi-annual inter-city Gymnastics Competition has been finalized! At stake is pride and reputation among your peers for putting in your hard work, blood, sweat, and tears, into preparing to compete in a tournament of physical skill! There will be two age categories: Adults and Young Adults which will compete separately. Talent scouts from the Equestrian Olympics will be present as well as college recruiters! Don't miss this opportunity to be recognized as the best Equestria has to offer! Sign up today!" You are invited to Star Light's Birthday party on the 15th at Ponyville Park! Gifts are not required, just come, hang out and have fun! P.S. Oh And Star Light if you're reading this its a surprise so please don't read this! This. Is. The. New. Server! If you are looking at this, that means you are on our new server! Anyway, we have had connection instablility started a few month back, and decided that for a chat we need service guarantee, so, well, we got one! With this, hopefully all these annoying occasional interruption, lags, and other things will be a thing of the past, so we can pony reliably, 24/7! Seem like it is fixed, we should be good to go form now on! Sorry about the down time between 14:00 to 15:00~. We are moving to the new server tonight! ETA hour or two? Incoming soon: Canterlot, Appleoosa, Manehattan, Cloudsdale rooms. How soon? Like, tommorow. or something. With the completion of the Rodeo the Apple family has begun to sell their world famous, entirely unique fruit jam, come get a jar of the fruit that put Ponyville on the map! In other news we would love to congratulate those who placed in the rodeo, our first ever Ponyville rodeo Champion Epona, the second place, VarienQuill and third- Nook! Thank you all who participated. "You are invited to Shaze's birthday party tomorrow, Saturday the 4th. This is not a formal event, but Shaze would like it if a lot of ponies came and had fun. It will be located at our home at the Nightmare Studio, which can be found near the fields. No gift is necessary, but it is greatly appreciated." You are invited to RainbowQuill's Birthday Party!!!! When? : August 19th, 21:00:00-23:00:00 Server time EXTENDED! Who? : Read the top you silly pony! To commemorate the annual Zap Apple harvest the Apple family is hosting Ponyville's first annual rodeo! The competitions will begin at 2:00 PM on Sunday, August 5th and will be followed by an afterparty where this year's first crop of Zap Apples will be sold! The whole town is invited and fun for the whole family is guaranteed. One Character per player will be able to participate and be scored. There will be seperate events open to foals as well, any questions comments and concerns (Both IC and Out) are to be directed towards Rodeo cordinator and host Applejack.